The Rose and Freesia Gift Set - A Luxurious Gift Set! 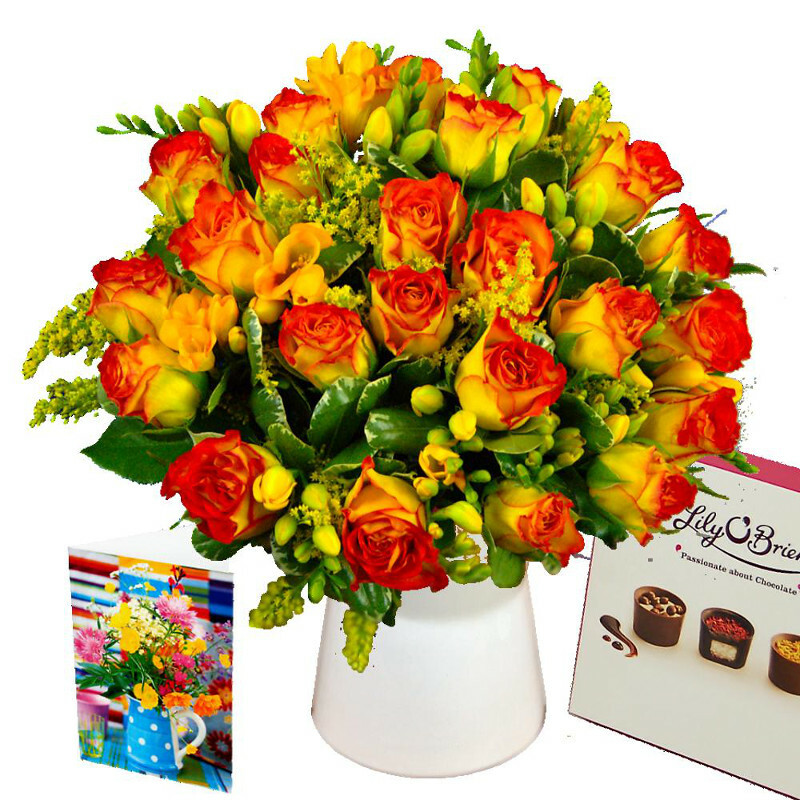 From our fresh range of variety flowers we bring you the Rose & Freesia gift set, a luxury hand-tied bouquet of orange roses and fragrant freesia, attractively presented with solidaster, wrapped in stylish florist's gift-wrap. Our freesia is delivered "in bud", which means the flowers have a longer vase life - so you have longer to enjoy the beauty and scent of your delivery of fragrant freesia! To make this bouquet even more special we will add in a Handwritten Card, a box of luxury Lily O'Brien's Chocolates and a chic glass vase. The Rose & Freesia Gift Set would be a wonderful gift for birthdays and anniversaries or as a way to say thanks, sorry, good luck, or congratulations. Any special occasion is sure to be all the more memorable when this luxurious floral gift set is involved. Have these flowers delivered 7 days a week throughout the UK. Your flowers will be delivered in our special delivery box to prevent damage while in transit, so they arrive in excellent condition all for just £49.99! Comes complete with chocolates, vase and cuddly love bear! We also have the Rose and Freesia bouquet available on its own, a large selection of arrangements containing roses as well as freesia and an array of different gift sets to suit every occasion.